Since graduating from Kingswood Regional High School, Heather has far exceeded her own expectation. Through the caring support of people who saw strengths rather than her weaknesses, she earned her LNA, received her Associates degree in Behavioral Sciences with a specialty in Geriatric Care Management, and has built a successful home care agency that started, first, with her own experience trying to care for her own parents in their home. “I’m a huggy, touchy, ‘I’m going to fix your life’ kind of person,” she says. “Being dyslexic and obese” growing up gave her a sense of wanting to help and support the underdog, she says. In her work, she has an intuitive desire to find the small things that really matter to clients: “the gems,” she calls them. She recalls washing a window for a woman who would look out her window for hours on end and start to cry. “What’s wrong?” she was asked. “My window is dirty,” she replied. Although homecare activities are usually limited to light housekeeping and windows are frequently forbidden territory even for house cleaners, Heather washed the window and immediately saw the woman’s spirits lift. After that, every aspect of her daily routine went smoother. and appreciation. “We never stop saying ‘thank you,’” she says, because she knows that taking care of people with dementia, Alzheimer’s or who are physically challenged and need personal care or homemaking services such as shopping, running errands, making meals, reminding them to take medications, and doing light house work, is challenging and emotionally taxing. Heather credits much of her own success to supportive women who did for her what she seeks to do for her own employees. Occupational Therapist Kristen O’Brien was the first to see Heather’s innate understanding of the intersection of physical and social needs of the elderly in Heather’s interplay with her own parents. She encouraged and challenged her to pursue her education in healthcare and gerontology. It was through Kristen, too, that Heather learned about the resources offered by Wentworth Economic Development Corporation (WEDCO). Heather touts WEDCO’s services whenever she can, telling other entrepreneurs about the services she has utilized and the advice—even reality checks—she has received there. She does see one service lacking at WEDCO, though. She calls it “the ultimate service,” chuckling a little. “I need them to provide a cloning service for my staff,” she pleads. She has 19 wonderful employees, but their services are in such demand, she says that she could easily employ 16 more just like them. While WEDCO does not offer cloning services at this time, perhaps you can fill Heather Tenney’s desire. 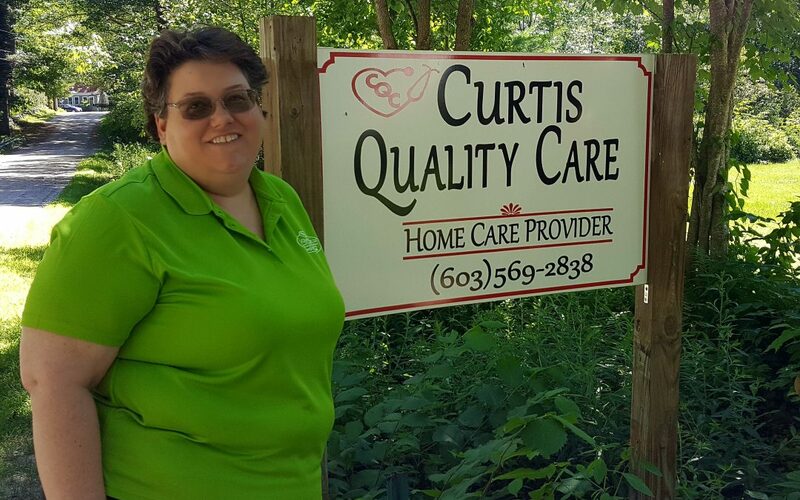 If you’d like to learn more about employment with Curtis Quality Care, LLC please contact her at homecare@curtisqualitycare.com or call her at 603.569.2838.